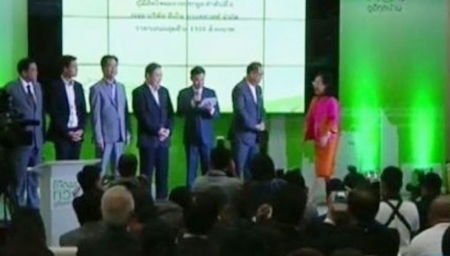 BANGKOK, Dec 27 – Today’s National Broadcasting and Telecommunications Commission (NBTC) auction for news channels ended with the highest bid reaching Bt1.338 billion. The NBTC made the announcement on the second day of its digital television licence auction in the capital. Natee Sukonrat, chairman of the broadcast committee, said the starting price was set at Bt220 million. The bidding prices was in accordance with the NBTC’s expectation, he added. NBC Next Vision, part of the Nation Group, won with the highest bid at Bt1.338 billion, followed by Voice TV bid at Bt1.330 billion, Thai TV under TV Pool Group at Bt1.32 billion, and Spring News at Bt1.31 billion respectively. Thai News Network under TNN Group ranked fifth with the bid of Bt1.316 billion, followed by DN Broadcast under the Daily News Newspaper at Bt1.31 billion. 3A Marketing came last at Bt1.29 billion. Post TV, part of the Post Publishing Group, I-Sport Media, and Mono Generation were the three companies missing out the auction. Meanwhile, later in the afternoon, the auction results of three licences to operate youth and family stations went to BEC Multimedia, a subsidiary of BEC World Plc, which operates Channel 3, at Bt666 million, MCOT Plc at Bt660 million, and TV Pool at Bt648 million.